But I followed the recipe to the letter! How many times have you followed a recipe as closely as you could and finished up with nothing but an inedible mess? I’ll admit, that even following my own recipes jotted down after countless successful outcomes, I’ve still been left wondering what went wrong on occasion. It’s frustrating and disheartening. It’s also one of the reasons that I don’t buy recipe books. I love cooking and I love reading, so it should follow that recipe books line my shelves and gather in ever-growing gangs around my house. Instead, I’ve a handful of books on my kitchen shelf and I rarely open them. The internet has all but killed any need for recipe books. Blogs, recipe sites and food forums share an abundance of recipes for every imaginable type of food. Why clutter the kitchen with glossy hard backs from television chefs when a quick look on my computer or phone gives me access to countless food sites? I’ve only ever bought one recipe book, a classic by Jane Norman to help me get to grips with basic cooking methods when I first began to take an interest in cooking. I still refer to it from time to time and I suspect that I’ll own it forever. The other books that line my kitchen shelf have been gifts from well-meaning friends and relatives. Truth be told, I tend to have a glance through cookery books once and rarely pick them up again unless I’m looking for something specific. Last week, I happened to look through a Gino D’Acampo book (another gift) and spotted a fun-looking recipe for a creamy rice pudding. It was simple enough for a dolt like me, so I carefully arranged the ingredients on my worktop and followed the recipe sentence by perfidious sentence with confidence. Sadly, our passionate, Italian chef seems to have little or no knowledge of the properties of arborio rice and the methods required to cook it successfully and two hours later, I was still adding milk to stubborn grains of crunchy rice. I was fuming. So rarely do I put my trust in the pages of slickly designed cook books, and the moment I do, betrayal occurs in the most irritating way: a recipe that doesn’t work. Sensing the potential for adaption, I threw away the offending pot of disappointment and started afresh. 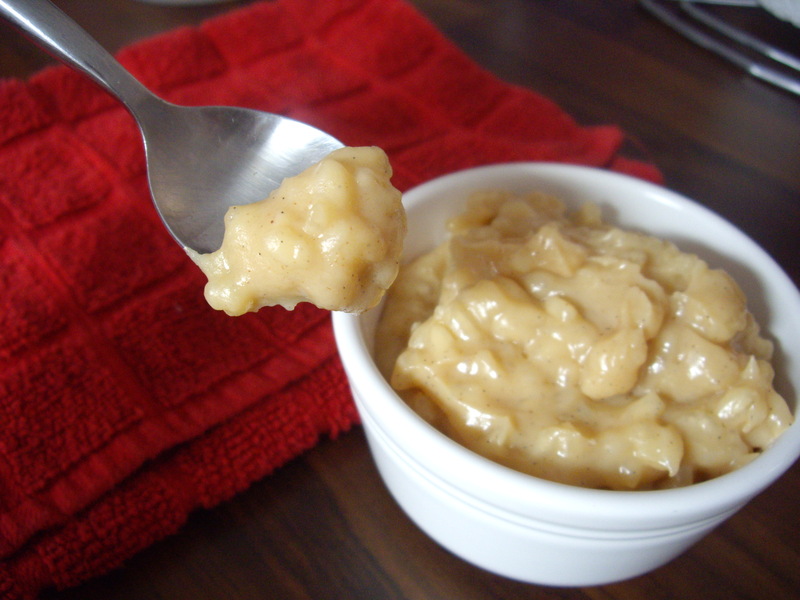 I cooked the rice as it should be, cranked up the sugar content and added two of my favourite flavours to produce a rice pudding with all the gloopy comfort that you’d need when the mood took you. I’ve realised over the last couple of years that following a recipe closely is not a guarantee of success. Instead, a grasp of some basic cooking techniques for whatever ingredients you’re using combined with your own instinct is a far better guide in the kitchen. I guess that sounds like sage advice from a wisened cook. In fact, it’s my disclaimer. I cooked the rice in a milk pan by just covering it with water and simmering until the rice absorbed the water and became tender. This took about ten minutes. During this time, I added more water to the rice as it was absorbed and tested the rice when I thought it was cooked. The next step was to stir in the sugar and add enough milk to cover the rice. I stirred the milk through until the sugar had dissolved and then added a little more milk every couple of minutes over a gentle heat. What you’re looking for is a gloopy, soft consistency where the soft rice is lost in a thick and sweet liquid. If the mixture becomes too dry, add more milk. If it is too watery, continue to stir it until the milk has reduced. When I was happy with the rice, I stirred in the vanilla paste and took it off the heat to cool. The rice becomes a little firmer upon cooling which is fine. My recipe makes one portion, but you could easily increase the quantities. As long as the rice is cooked through before you add the milk and sugar, the results will be satisfying. 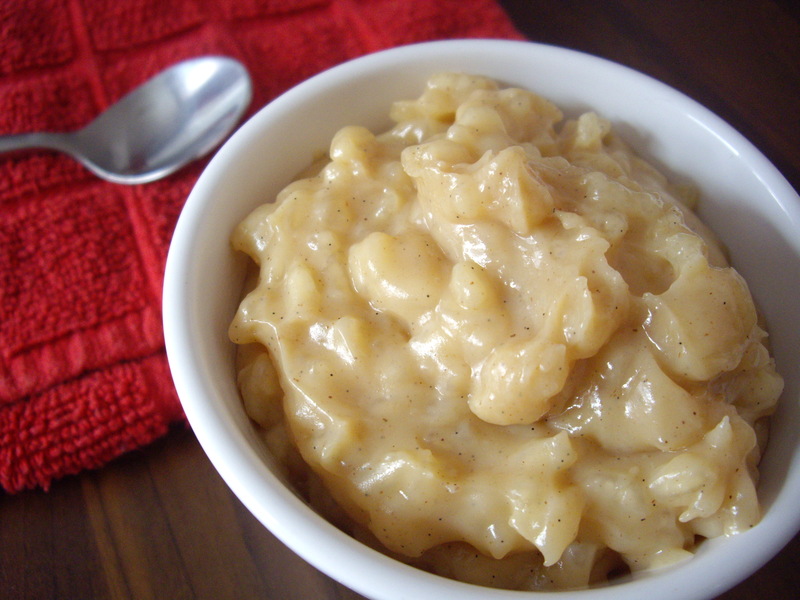 This entry was posted in Vanilla & cinnamon rice pudding and tagged Arborio, cinnamon, cook books, Gino D'Acampo, recipe books, rice, rice pudding, vanilla by Dimitri @ The Last Piece of Cake. Bookmark the permalink. My mother made rice pddiung when I was growing up and your post reminded of those wonderful days when, after the pddiung was cooked and poured into a large bowl to cool, my mom would hand me a large spoon to clean up what was left sticking to the pot. That was the creamiest part! In Cuba, the rice pddiung is flavored with cinnamon and lime peel your photo took me back to those days of comfort. I like the sound of that! What a cool memory. I also like the sound of Cuban rice pudding. It’s all about comfort, isn’t it? Mmmmmm….